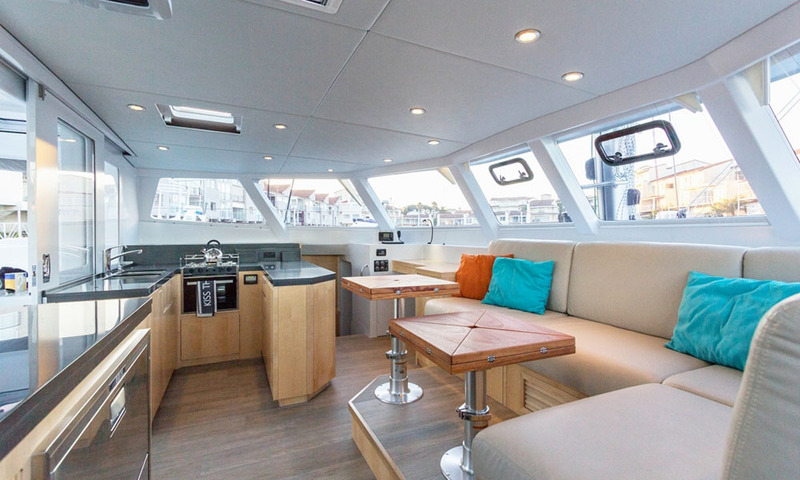 The Balance 526 is a very good-looking, South African-built catamaran of which 6 examples are currently sailing (numbers 7 through 10 will be in the water 2019/2020… ). We haven’t yet had the chance to test one, since all the owners are off making the most of their multihulls… But Dave Block, well-known professional skipper, agreed to give us a detailed analysis of his experience on the Balance 526! I first heard of Balance Catamarans from delivery skipper friends in the Caribbean who were impressed with what they had seen and heard. I therefore jumped at the chance when Reliance Yacht Management asked me to deliver a Balance 526 called Dragonfly (hull #4) from Tortola to Newport, RI, in May of 2018. After a bit of research, I learned that the 526 was built by legendary professional South African big wave surfer and boat builder Jonathan Paarman. After leaving the composite and tooling division of Voyage Yachts, which he ran for eight years, he set up a factory in St. Francis Bay in 2008 with a view to crafting high-end carbon/epoxy voyaging cats. It began with a 60-footer that he launched in 2010 for fishing and surfing expeditions in Indonesia. That later led, in 2013, to a thriving partnership with American sailor and yacht broker, Phil Berman, a former Hobie Cat World Champion and author of a range of books on catamaran sailing and racing. It is hard to imagine two more experienced men coming together to design and build a voyaging catamaran. Paarman and Berman were of like minds when it came to the sort of catamaran that they would want to sail if they ever had time to do it. They were serious racers when young but recognized that what they most wanted to do was have adventures on the water. Going fast was great, but they wanted a boat that could be easily short-handed, repaired in remote locations, and which would have enough payload capacity to carry fishing gear, kayaks, surfboards, dive gear, a big tender to travel to remote surfing reefs, and plenty of parts and spares, together with large fuel storage capacity when required. The like-minded surfer/sailors decided pretty quickly they wanted to work together on a new design that a couple could sail around the world in speed and comfort. They then partnered with Cape Town naval architect Anton Du Toit to oversee the engineering and fine design details. Judging by the result, it was an excellent coupling of strong talents – the Balance 526 I delivered is a truly remarkable performance voyager – a sort of BMW M series for the open seas. Balance builds the 526 with either fixed highperformance keels or with dual dagger-boards. The boat that I sailed, Dragonfly, sported fixed keels, so I can only speak about the performance I experienced on her. For those who are curious about the performance differences of a 526 with keels or dagger-boards I strongly suggest visiting the Balance website where you will find a comprehensive comparison of the two configurations. It also offers 526 performance polars for the two configurations in a wide range of wind conditions. Now, back to Dragonfly. She was a fully cruise equipped 526 with a 6.5 kW generator, 1300 watts of solar panels, washing machine, watermaker, two refrigerators and two freezer units, a life raft, full house air conditioning and four sails in her inventory. Prior to departing Tortola our crew of three topped off her fuel and water stores. Given the above our experiences of her performance should accurately reflect a keeled version Balance 526 in a laden ocean passage cruising mode. Although our delivery had a lot of low and no wind days, we had enough variety in our 1,800 nautical mile trip to get a solid feel for her speed, motion, and live-ability in a good range of winds and seas. We delivery skippers learn early on that every boat we deliver has a “sweet spot” where she slithers through the water effortlessly, and this speed for the 526 is in the 10 to 12 knot range when fully laden with any breeze over 12 knots. On a broad reach with her large Code Zero she will often do wind speed in true winds as low as 7 knots. Upwind in a 12 knot or better breeze she wants to sail around 9 knots. Crack off to a close reach in the same winds and we pulled 10 to 11 knots. Upwind in 14 knots or better she will get to 9.5 to 10 knots and close reach in the 11 to 13 knot range. Give her 17 knots or more and she will not go any faster upwind (you take in the first reef in the mainsail at about 14 to 15 knots true), but as soon as you crack off to a close reach or beam reach expect speeds in the 13 to 15 knot range. In very strong winds surfing with the wind aft she will sometimes burst nicely into the high teens to low 20’s, but such speeds will not be sustained consistently. Several Balance owners have reported 24-hour periods covering 260 miles or more. This is one very, very fast catamaran – laden or empty. I found the ride to be smooth and pleasant with little fore and aft pitching. The designers took pains to center the heavy weights on her carefully, leaving little heavy equipment in her bows and sterns. The 526 steering system is a mechanical racing type design – large Edson sprockets carry spectra cords around pulleys. The feel is sumptuous for a catamaran, where the normal feedback we get on charter builds is akin to driving a semi-tractor. For the sporting sailor this helm will not disappoint – it is perfectly balanced and responsive on all points of sail. Another distinctive characteristic is the view: even when sailing her on autopilot, walking about the 526 with the remote control in hand, the visibility and the sight lines, are the widest and clearest of any catamaran I have ever delivered. Whether you are piloting the 526 down below, up top, sitting in the saloon, or in the aft cockpit, the clear views in all directions are remarkable. The designers have removed as many blind spots as is possible on a catamaran. The standard 526 comes with dual Yanmar 45 HP engines but I was told that so far, every customer has upgraded to the Yanmar 57 because it adds no additional weight to the boat. At full throttle in flat seas with both engines she will motor at 10 to 10.5 knots, but when passage-making we ran one engine at 2,400 RPM and this moved us along nicely at 7.5 knots. Fuel consumption at this speed on one engine is very low, giving her outstanding range with her fixed tanks. Balance adds a fuel transfer pump to the large locker in front of the mast for those who wish to extend motor range by adding a bladder tank or jerry cans. The Balance is built like most epoxy carbon reinforced racing cats. There is not a single fiberglass interior module, nor any fiberglass furniture modules, to hold down weight. Each and every piece of furniture is hand crafted at the factory using light weight cored panels. The bulk of the interior is hand sanded and painted to a smooth white finish to avoid the use of liners or wood paneling. The workmanship is superb, reflecting thousands of hours of careful fairing and paint work. A catamaran such as this built in Europe or America would surely have to cost many thousands more due to the enormous labor costs associated with such a build. All the handholds, doors, and cockpit furniture are in composite. There is simply no wood or stainless steel found on the deck of this catamaran, other than the bow pulpit seat. The amount of cabinetry on the 526 is significant compared to any other performance catamaran of this length that I have seen. 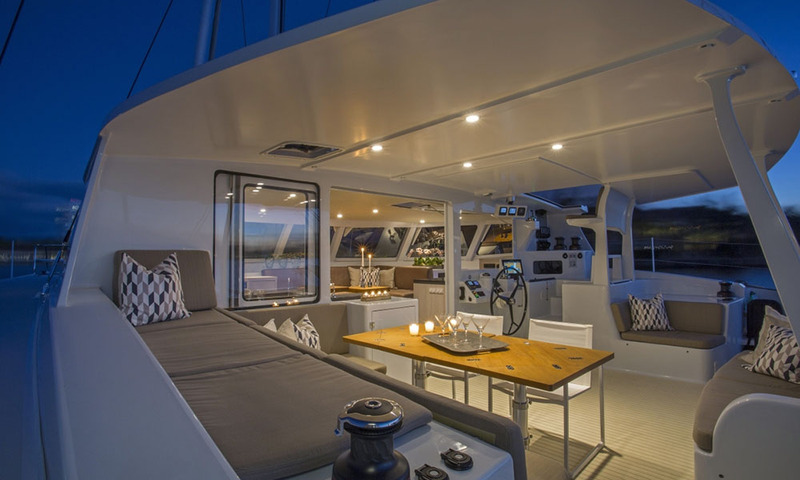 It is not the sort of spartan catamaran where guests will be climbing over clothing and gear as each cabin provides ample drawers, hanging closets and shelves. It is evident to anyone who sees or sails this boat that Berman and Du Toit come from practical sailing backgrounds, but are also driven by strong esthetic philosophies. The design and look of the 526 is gimmick free. Her lines are lean and angular, crisp and contemporary, free of any garish bling – understated and elegant. When we pulled into Newport harbor on Dragonfly all heads turned. The only major negative to the Balance 526 is that most of us cannot afford her. She comes in at a base price of $1,399,000 U.S. dollars, and most of the units leave the yard cruise-equipped at around 1.6 to 1.7 million dollars. This actually appears to make her the least costly carbon/eglass/epoxy cat on the market of her size, but there are cheaper alternatives for those that require it. The buyer for a Balance 526 must be the sort of experienced sailor who appreciates the build quality, performance, and design features she offers. It comes as no surprise that all of the buyers for the 526 so far are purchasing their second or third large catamaran.